Well, we’ve had three days of Roland Garros, with some great clay court tennis, the odd upset or two and my Tennis for Free dream team isn’t doing too well. A history of achievement builds confidence and the reverse can also be true – two impressive performances from players ranked just outside the top 50, one playing the greatest clay court player in history, in Rafael Nadal, the other taking on the world number one, Djokovic. In yesterday’s match, Daniel Brands, a German ranked 59, played sensational tennis to win the first set against Nadal, and was up 3-0 in the second set tie-break, before Nadal finally ran out the winner in four sets. Djokovic was also pushed by the Belgian, David Goffin, taken to a tie-break in the first set. With Goffin playing exceptionally well, Novak managed to win the critical points and ran out a winner in three relatively tight sets. When faced with a lower ranked opponent playing out of their skin, particularly as happened with Brnads against Nadal, going for big forehands at every opportunity, the top players don’t panic. Occasionally, it the lower ranked player causes a major upset, as happened for Nadal against Lukas Rosol at Wimbledon last year. However, more frequently, the experience and ‘having been there’ many times before pays off. Federer said earlier this year that over his career of over a dozen years in professional tennis he had faced most situations possible on a tennis court so never panicked and focused on working out a strategy to overcome the challenge in front of them. While it may be nice to have a quick win and get back in the locker room, the top players thrive on the challenges that opponents provide them. Witness Tommy Haas, still playing amazing tennis at 35, loving being out there, whether he’s playing another experienced pro or using his experience to counter an up and coming ‘young gun’. On the other hand, players like Goffin and Brands may find it easy to motivate themselves against one of the world’s famed top four opponents but they also have to learn to play at that level and win consistently. Without that building that consistency, when facing the top players doubt is always not far away, particularly in tight situations. 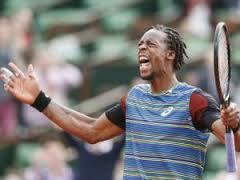 There seemed to be no such doubt in the performance from Gael Monfils, in overcoming Berdych yesterday. Monfils, having been out with injury for most of the last year and a ranking down at 81, was one of the most dangerous floaters in the draw. Unlike Brands and Goffin, Monfils has proved himself against the top players, with a career high ranking of seven. He took the first two sets against Berdych, playing some amazing tennis. Berdych, being the competitor he is fought back to take the next two sets, both on tie-breaks. A lesser player may have been dispirited but Monfils used a partisan French crowd to lift him towards the end of a tight final set, winning 7-5. Monfils did not lack doubt and it was a memorable battle between two big hitting players, even if Monfils has a worse sense of colour co-ordination than I do. This entry was posted in Roland Garros by aitkenhead. Bookmark the permalink.